(Left to Right) Eadon(Chair), Phillips (1st Vice Chair) , Pope (2nd Vice Chair), and Owens (3rd Vice Chair). Iowa Democrats will move forward after the 2016 election disaster with a lot of younger, diverse and fresh faces heading up their efforts. At the party’s State Central Committee meeting on Saturday, voting members selected younger leaders for the top four slots of party chair and the vice chairs. Derek Eadon, 33, was voted in as chair. Andrea Phillips, 42, won the 1st Vice Chair spot, which is also a DNC voting member. 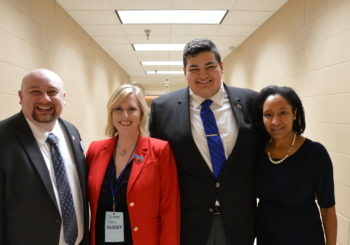 Jordan Pope, 19, beat out a state representative to become 2nd Vice Chair. And June Owens, 45, became the 3rd Vice Chair. Jean Pardee, who has served on the SCC for several decades, said she couldn’t remember the last time the party had a team this young. She first joined the SCC at age 21 – in 1972. Eadon promised Democrats a new approach in his bid for chair, making the case that the party needed a new way of thinking and should be opening and inclusive for all voters. Through his past work for Barack Obama’s campaign and NextGen Climate Action, Eadon has worked extensively in turning out young voters.